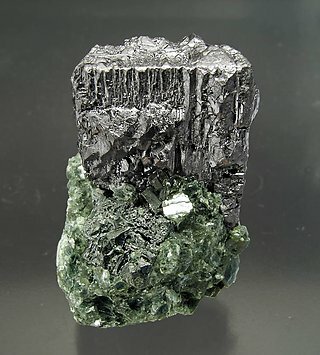 This is a great specimen with the pseudo-cubic crystal on matrix. It shows a curious bumpiness caused by the combination of the pseudo-cube with the pesudo-dodecahedron, which is a crystal form we have seen before in this species. The luster is also excellent. Pseudocubic crystal with complex faces due to development of multiple pseudo-octahedral forms covering them. Crystal is very bright and is on a matrix of small crystals of Clinochlore. The specimen has been reviewed, photographed and published as a new discovery in the magazine ‘‘Mineral Up’’ on page 29 in number 2006/1. 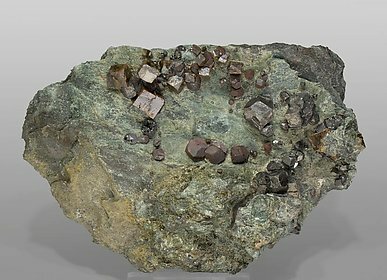 Dark brown pseudocubic crystals of Perovskite on a Clinochlore matrix. Crystals are very sharp and free of growth figures, very unusual with Russian specimens. 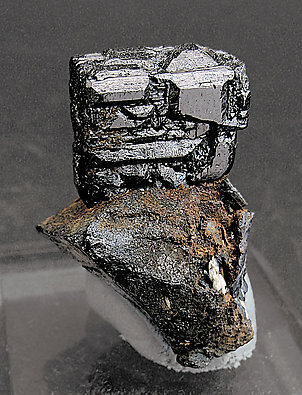 On the left side of the specimen between two Perovskite crystals one can see small, very well defined Magnetite crystal. 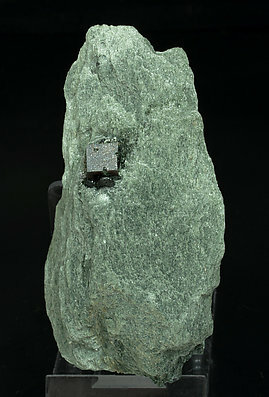 Pseudocubic crystal of very well defined faces and edges and with a quite significant ”hopper” growth, on a Chlorite matrix. The crystal is very prominent and very esthetic. Equant (pseudocubic) Perovskite crystal. 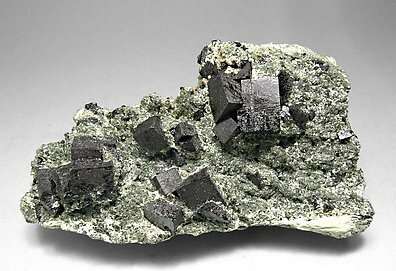 Bright and with a dark brown color, it is on a chlorite matrix, with small black Magnetite crystals. The sample, not included in Calcite, has not been acid treated so it maintains a very good luster. Very well defined pseudo-cubical crystals of Perovskite, dark Brown and very bright for the species. 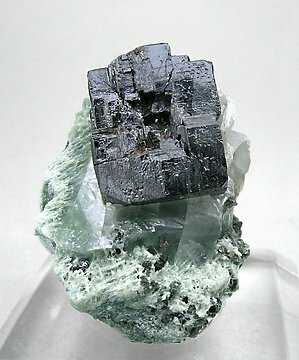 On a Chlorite matrix, with dodecahedral crystals of Magnetite.